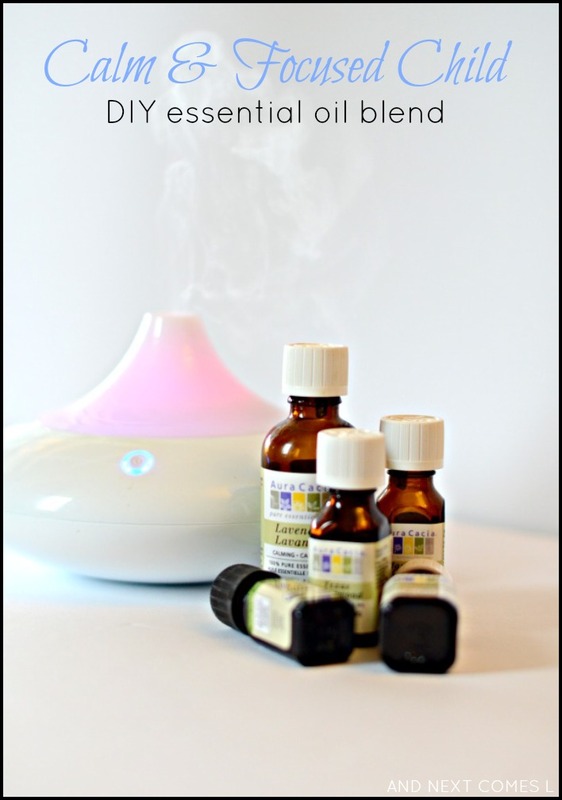 Essential oils have become a huge part of our daily routine in dealing with sensory issues, anxiety, and autism. After some trial and error, I have finally concocted the perfect blend for our family. I call it the calm and focused child essential oil blend because it does exactly that. It calms my sons' sensory responses, balances their emotions, and keeps them calm and focused. It has drastically reduced the number of "bad autism days" in our house. 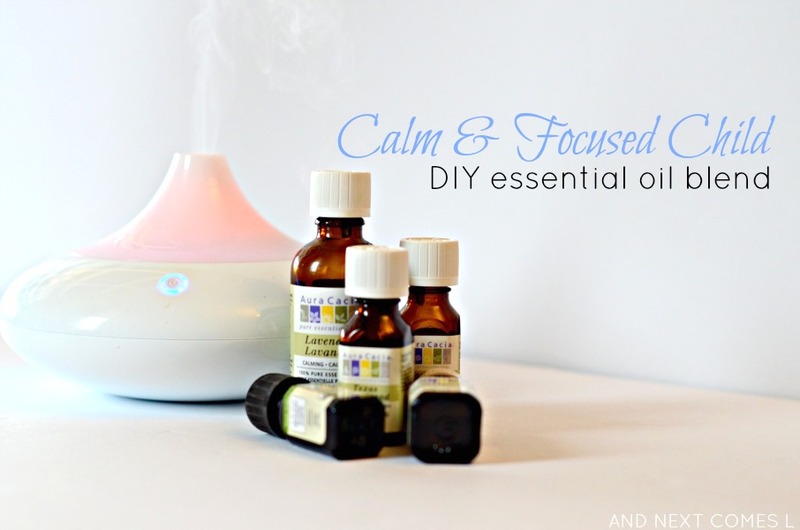 It is definitely my go-to DIY essential oil blend! I am not an aromatherapist. I am just sharing a blend of oils that has worked well for our family. This blend is meant to be diffused and/or mixed with a carrier oil before applying to skin. Never apply this blend to the skin without a carrier oil. I should also note that this blend does wonders on both children, autism or not. So it is great for all kids. I simply add the oils to 80ml of water in our diffuser and diffuse first thing in the morning. Here's a breakdown of what each oil does. Lavender is great for calming and relaxing. Mandarin orange balances emotions (good bye autism meltdowns! ), but I mostly add it because I like the smell. To be honest, I cannot stand the smell of any of the other oils individually. Frankincense has a sedative quality, making it great for reducing stress and anxiety. Cedarwood helps to focus the mind and balances emotions. Finally, vetiver calms the sensory system and stabilizes emotions. When I diffuse this blend, I find that sensory meltdowns are reduced and that J focuses better on his schoolwork, both at home and at school. On days that I forget to diffuse this blend, J seems more agitated and more prone to autism meltdowns. It definitely helps balances his emotional responses when he is having sensory issues. So needless to say, I always make sure to have these oils handy. Another option is to add the essential oils to a cobalt blue glass spray bottle and top it up with water. Shake before applying. You can either spray it into the room like an air freshener or spray on the skin. I usually spray it in two spots on the skin: back of the neck and on the back at the base of the spine. I apply it to both of my children every morning and it makes a huge difference in our day to day life. Thank you for posting your blend. I want to be able to make my own and not use mlm oils. You're welcome! Not to mention, MLM oils are so expensive too! How many ounces is your spray bottle for this amount of drops? I'm debating between a 2 oz spray bottle, a 5 ml roller, or a 10 ml roller. Do you increase the amount of drops for your spray or use the amounts listed above? Thank you. We use a 120 ml spray bottle (which is about 4 oz) and use the amounts listed above. We also use a 9 ml roller mixed with a carrier oil. Hope that helps! Would you use the same amounts in a roller with a carrier oil? I do. Anything stronger seems to bother my one son's skin. So I stick with the minimum number of drops mixed with a carrier oil (we use sweet almond oil) in the roller. That's great! I am hoping this combo will help with my son who is on the spectrum and has PDD-NOS. I have sweet almond oil so that works perfect! Thanks so much. Let me know how it works for you! Good luck! Hi - I saw in a post that you apply vetiver to their backs. Do you put in a carrier oil? If so, how much? One drop in a tablespoon of carrier oil and then apply to their lower back and the back of their neck. Thasks for sharing. I appreciate the fact that you are not mentioning a particular brand of EOs. What carrier oil u use.. I like to use sweet almond oil, but I also use coconut oil as well. I am new to essential oils especially using for my children. I will definitely check out some of the books you recommended. Is this blend just as beneficial and effective if used at night in a diffuser? I am looking for natural ways to help calm my son. He is 4 and has what appears to be high anxiety and separation anxiety. Yes, it will definitely be great at nighttime! I actually have a different blend that I use specifically for night in a diffuser. I will try to find time to blog about it in the next few days. When you use the spray on back of neck and spine do you mix with water and use a carrier oil too? Sorry I'm new to this! Or just use a roller with same amount of oil as listed mixed with a carrier in the roller? You could do it a variety of ways: mix with water and spray OR mix with a carrier oil and rub OR mix with a carrier in a roller bottle and then apply. What I'm looking for is a slight calming for before school, along with the focus. Then a different blend for right before bed to relax even more. We do give our son melatonin to help him sleep or he (and us) would be awake all night long every night. I'd like to mix it in a body lotion as he loves massage. Hi. I have a 2 and a 4 year old. Would this be ok for their ages? Also, how much carrier oil do you add with your oils? I'm trying to figure out how I would make this. Im new to using oils. Blessings and Thank you. It should be okay to use with those age groups, but I would be cautious with your two year old (i.e., use less EOs with them and dilute more). As for how much carrier oils, try 1 drop of this blend mixed with 4 teaspoons of carrier oil. Hope that helps! I would just leave out the lavender. The blend will still be calming. I plan to use a 700 ml diffuser in my classroom. How do I adjust the number of drops you listed? I probably would only do one extra drop of each at most, to be honest. I've been looking at diffuser bracelets for my 8 year old daughter and I. The website I'm thinking of ordering from says to apply 2-3 drops of the essential oil directly to the bracelet's lava beads and then let it absorb in before wearing. It doesn't say anything about a carrier oil. Do you recommend a carrier oil for that kind of jewelry too? Sorry I know this is an old post, but it came up in my google search. Thanks! I have never used a diffuser bracelet before so I am not sure exactly how they work and whether or not they need a carrier oil. Wish I could be of more help!